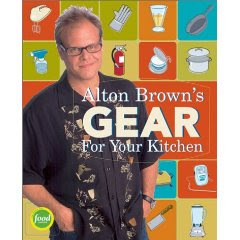 Winner of Foodie Freebie Friday: Alton Brown's Good Eats! Foodie Freebie Friday is here! It's already been a long day for me, after a 2 hour commute into work - one way. But thankfully I'm now in the warmth of the office and trying to thaw from the winter cold up here in Chicago. So there I am, immediately behind Alton, pretending to look at this knife display... as if it was more interesting than speaking to Alton himself. Alton turns around and looks at me apologetically. "Oh, I'm sorry. I didn't mean to get in the way of the display," says Alton. "Oh no worries. I was curious about this line of Shun knives. Do you have a preference in a specific Shun line of knives?," I replied. "Yes, but I'm kinda busy right now. I'd love to talk to you about it after I get through this line..."
Handsdown favorite episode is the turkey frying episode. My husband and I watch it every Thanksgiving on You Tube. It cracks us up! This year we fried our turkey and used this episode as as guide. So fun! Congratulations Linda and Matthew! An email has been sent to you to confirm your mailing address so your package can be mailed out today. Thanks to all those that commented and stay tuned to the next Foodie Freebie announcement on Monday, January 19, 2009! You won't want to miss the next one, especially if you love to bake! What a funny story! He sounds super nice too. My kids love Alton. He is interesting and funny! Awesome giveaway. That's funny! I probably would have done the same thing. Haha...I would TOTALLY do something like that if I walked up to a celebrity I admire. I would love to meet him!